1973 – FTP was written by Abhay Bhushan in 1971. It was published as RFC 114. FTP allows a TCP control connection to the FTP server port 21 to pass data. 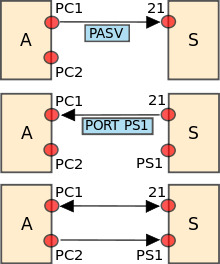 The FTP protocol was made a standard as stated in RFC959 Declarative. The declaration outlined the ports used, commands FTP accepted, values for transfer parameters and the modes allowed. FTP servers have been a crucial part in the connection between computers. FTP connections via the Internet allow webmasters and app developers to upload, edit and remove files on remote servers. Later, a more secure FTP protocol was added to prevent hackers from infiltrating the server.